Bitola is the second largest city in Macedonia. Bitola is located on 169 km from the capital Skopje and from the nearby city Prilep, is just 41 away, while from Ohrid is 66 km away. Bitola lies on an altitude of 600 meters above the sea level, at the foothills of the mountain Baba and it has 80,386 inhabitants, while the entire Bitola municipality counts over 90,000 people. It is the regional, economic and university center of south-western Macedonia. Present Bitola was founded after the arrival of the Slavs in these areas, near the ancient city of Heraklea Lynkestis. 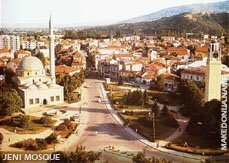 Because of the numerous churches and monasteries which existed in the city, and its surrounding, the city was named Obitel, which is the origin of the present name, Bitola. During the reign of Tzar Samoil, Bitola was included within the Macedonian state and was the seat of Bitola's bishop. From this period originates the first written record of Bitola, from 1014, when Bitola was first mentioned in the historical sources. Until the conquest of the Turks, Bitola represented a significant center of trade in the Pelagonija valley. After 1382, the city fell under Turkish rule. It retained its role as a developed trading center for goods from Greece, Albania and the surrounding locations. 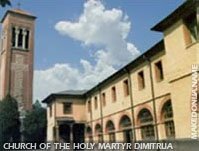 It also became an important Islamic religious center, and a religious high school existed in the city, until the end of the 17th century. According to the notes of the writer Evlija Čelebija, in this period in the city existed 70 mosques, several cafe-tea rooms, bezisten (old turkish market) with iron gates, and 900 shops were built. Bitola exceeded the attractions of Skopje, with the developed trade, the beauty of the river Dragor, and its green areas. After the Austrian-Turkish wars, together with the other cities in Macedonia, the trade development and the overall thriving of the city was stifled. 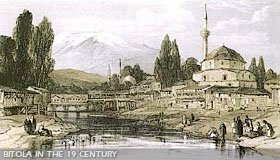 In the second half of the 19th century, however, again, it became the biggest city in Macedonia, after Solun (Salonica) and resumed the role as the main center for trade. The shops were filled with goods from Leipzig, Paris, Vienna, London and a lot of other European cities. 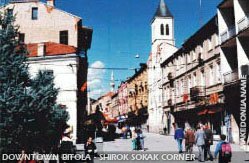 Bitola is also known as "city of consuls", because Bitola used to be a diplomatic center with 12 consuls during the period 1878-1913. Later, after the division of Macedonia, Bitola became, an important city in Kingdom of the Serbs, Croats and Slovenes. During the First world war (1914-1918), Bitola got almost demolished due to the line of the Macedonian Front (1916-1918), which was passing south of the city. Of the 28,000 citizens, only 5,000 remained living in the city. During the Second world war (1941-1945), the Germans and later Bulgarians controlled the city, until it was liberated in 1944 by the Macedonian Partisans. Especially interesting and beautiful is the old-city architecture in Bitola. The Bitola Bazaar (Čarsija), retains numerous old crafts workshops, and it represents one of the most interesting bazaars in Macedonia. On market days, the visitors may find various hand made garments, traditional for the Macedonian area. Today, Bitola is an administrative, economical and cultural center in the south west of the country, with a developed network of institutions in all domains. The University of St. Clement of Ohrid in Bitola, comprises four faculties and two colleges, and 5,000 students studying in Bitola, Ohrid and Prilep. The Science Society is another active institution in Bitola. There is a large number of cultural institutions as well. The best known among them is the Bitola Theater, which has won the highest theater accolades at many festivals in the country and abroad. The Art Gallery and a number of cultural and artistic associations have recorded a continuously upward line of activity. Bitola is the organizer of the "Manaki Brothers" international festival, devoted to the work of the first film cameraman in the Balkans and achievements in the art of cinecamera. It is the only event of this kind in the world. Bitola also hosts the international art event entitled 'Small Bitola Monmartre' and the Interfest festival of classical music. The 'llinden Days' folk music festival is another event held there each year. Bitola has a vast economic potential. The Pelagonija agricultural combine is the largest producer of food in the country. The Streževo water system is the largest in Macedonia and has the best technological facilities. 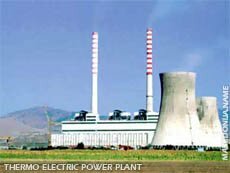 The three thermoelectric power stations of REK Bitola produce nearly 80% of electricity in the state. The Frinko refrigerate factory is a leading electrical and metal company. Bitola also has significant capacities in textile and food industries. Bitola is turning into the second diplomatic center of Macedonia. France, Turkey and Italy have already opened consulates there. Bitola has a vast tourist potential as well. Numerous and important monuments of culture have survived from its rich history. The town and its surroundings abound in natural beauties. The church St. VMČ (Veliko Mačenik) Dimitrija was built in 1830. At the time of its construction, upon the request of the Turkish authorities, the churches were supposed to be modest, and they could not surpass the Turkish mosques in their beauty. However, the church interior possesses a rare beauty. Especially important is the iconostasis made in representing elements of fauna and flora, especially skillfully. The Ajdar-kadi (Turkish judge) mosque is one of the most attractive monuments of the Islamic architecture in Bitola. It was built in 1561-1562, as the project of the famous architect Sinn Mimar, ordered by the Bitola kadija Ajdar-kadu. The mosque was abandoned and over time, it was heavily damaged, but, the recent restoration and conservation works, have restored, to a certain extent, the original appearance to the mosque. The Jeni mosque is located in the centre of the city. It has a square base, topped with a cupola. Near the mosque there is a minaret, 40m high. Today, in the rooms of this mosque permanent and temporary art exhibitions are held. The Isak mosque is the inheritance of the famous kadi Isak Celebi. In the spacious yard of the mosque, there are several tombs, attractive because of the soft, molded shapes of the sarcophagi. The Bezisten (the old Turkish market) is mentioned in another description of the city from the 16th and the 17th century. The present Bezisten in its external appearance does not differ much from the original one. The Bezisten had 86 shops and 4 large iron gates. The shops were used for selling textiles, and today they are being used for selling food products. The Bath Deboj (Turkish bath=amam). The period of construction is not known. This Amam over time was heavily destroyed, but, after the repairs were made it re-gained its original appearance: beautiful facade, two large cupolas and several minor ones.